In Monfragüe (Extremadura) Is the most extensive and best preserved spot of Mediterranean forest in the world, surrounded by mountains covered by holm-oaks, forest and Mediterranean scrub and sprinkled with rocks and streams. On the other hand, rivers and reservoirs water the riparian areas of the national park. The name of Monfragüe comes from “mons fragorum” (dense mount), Which was the denomination given by the Romans to the territory that now forms Extremadura and that belonged to the province of the Empire of Rome known as Lusitania, whose capital was Emérita Augusta. There is no doubt that the Romans left an impressive historical and cultural legacy. The enclave in question is located in the center of the province of Caceres, in the triangle that would form the well-known villas of Plasencia, Trujillo and Cáceres. Its backbone is the Tajo river On its way through soft mountains surrounded by extensive meadows. 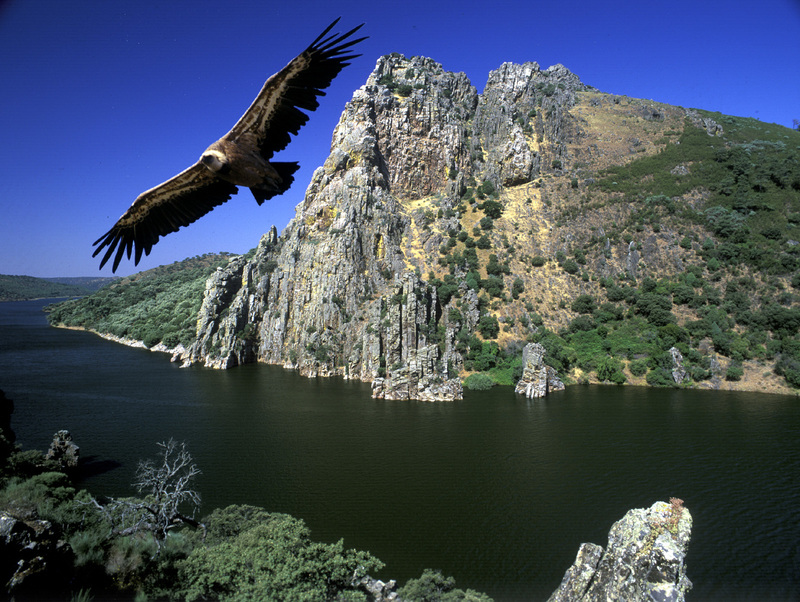 It was the first protected area of Extremadura. In addition to the category of national park, several protection figures coexist on this territory. In 1991 it was declared a Zone of Special Protection for Birds, a figure that would be extended later (2004) until the current ZEPA ”Monfragüe and Dehesas del Entorno”, which covers the 116,160 hectares coinciding with the Peripheral Zone of Protection of the National Park. In the park they breed more than 200 species of vertebrates, many others winter or can be seen of passage during the migration to other latitudes. Birds are the group of vertebrates with greater abundance of species and individuals, being able to put as example to the black vulture, the imperial eagle , The griffon vulture, the Royal Owl, The Royal Eagle And the Bonelli’s eagle. Among the carnivores are, among others, the Otter, The gardener, the wildcat, the badger and the fox. Deer, wild boars and rabbits also proliferate. Undeniably, there are infinite facets and ecological niches that Monfragüe offers us, which makes it an increasingly sought after destination for nature lovers.